December 2013 Ontario Food Cluster newsletter. Download The Appetizer (PDF) here. 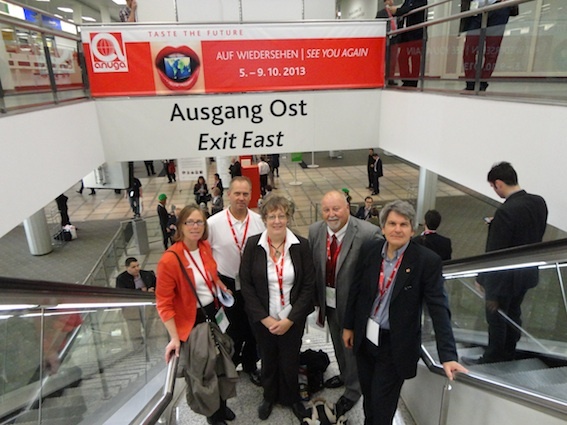 Ontario Food Cluster members "taste" trade and investment potential with 150,000 global food industry executives at ANUGA 2011, in Cologne, Germany. Canadian food manufacturing from coast to coast - slideshow article by Tavia Grant and Carys Mills, Globe and Mail, (July 19, 2011). Ontario-based Saputo Inc. and Organic Meadow Inc. are featured as well as the Guelph Food Technology Centre. Ontario Food Cluster members are attending IFT11 Annual Meeting + Food Expo in New Orleans, Louisiana, to present Ontario's processing innovation evidence to the global industry, as Ontario seeks more agri-food firms outside of Canada to join or expand its exisitng 2,500 food and beverage companies in the province. Most of the Ontario Food Cluster team, Members of the Ontario Food Cluster attended SIAL Canada 2011, May 11 - 13, in Toronto. The Ontario Food Cluster's key objective is to attract new and expanding international agri-food businesses to Ontario. "Our mission is to grow Ontario's national dominance to international dominance," says Gerry Pisarzowski, Vice-President Business Development, GTMA, and Ontario Food Cluster member for the Greater Toronto Area.